← Tampons Are A Luxury But Viagra Is Not? Hermione Granger of Harry Potter is a strong-girl-turned-strong-woman. 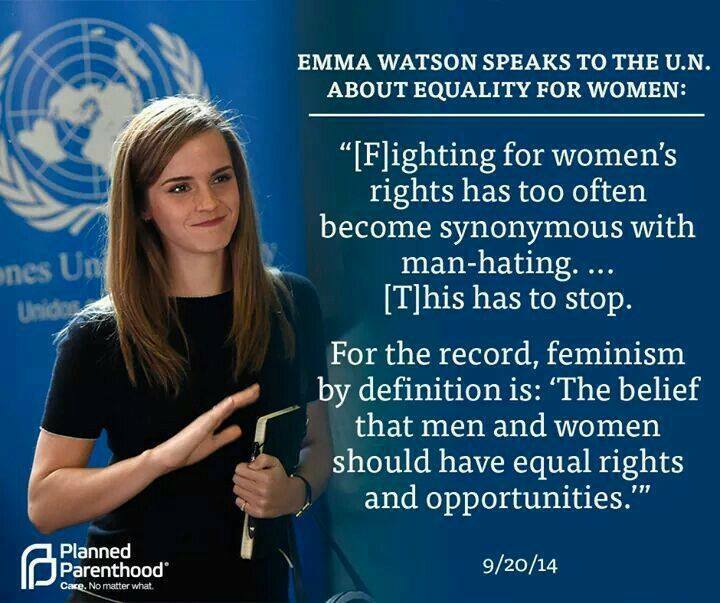 And so is her alter ego, Emma Watson, who has spoken before the United Nations on the need for feminism. Feminism, by definition, is the belief that men and women should have equal rights and opportunities. I think it is right I am paid the same as my male counterparts. I think it is right that I should make decisions about my own body. I think it is right that women be involved on my behalf in the policies and decisions that will affect my life. I think it is right that socially, I am afforded the same respect as men. My parents didn’t love me less because I was born a daughter. My school did not limit me because I was a girl. My mentors didn’t assume that I would go less far because I might give birth to a child one day. These influences are the gender equality ambassadors that made me who I am today. They may not know it but they are the inadvertent feminists needed in the world today. We need more of those. Emma is so committed that she is taking a hiatus from her acting career to focus on feminist activism — in which she is schooling herself — and heading up the HeForShe project. This is part of a recurring series on feminist celebs. Posted on April 8, 2016, in feminism, sexism, women and tagged Emma Watson, feminism, sexism, women. Bookmark the permalink. 30 Comments. I remember seeing Emma Watson talk to the UN the first time. At first when I heard about it I thought this was a publicity stunt but as soon as I finished watching her entire speech I was speechless. I realized that someone like her, someone who is famous and can use there fame to make there voice be heard even more is great. I think by using her fame to have her voice be heard is great. And what she said had to be heard and was heard from her being famous. She used her fame to then not only talk to the UN but also have her speech become a viral sensation and then not only the UN will listen to her but the people who see the video! Usually most people who watch the UN speeches will only be the people who listen to them, unless it’s another famous person like Malala. So I am always happy to hear and see that Emma Watson is still supporting Feminism! Suddenly, Emma from a little girl into a mature woman. I quite agree with Emma. And she also expresses all my personal idea. In order to realize a gender-equal society, we must solve women’s problems first. To do so, every individual woman must cultivate her consciousness and ability, and strive to be more powerful in every way: politically, economically, socially and culturally. It is also important to change the society and the notions and behavior of men. It is necessary for them to understand why woman are always regarded as a weak social group. More terrible is that some women have automatic regard themselves as vulnerable groups. Girls and boys are perceived and treated differently from the moment of birth. In the article, “Lean In: What Would You Do If You Weren’t Afraid?”, by Sheryl Sandberg clearly knows about that “from the moment we are born, boys and girls are treated differently”. Because many parents describe infant girls as tiny, soft, and sensitive, and sons as strong, and they interact differently with infant girls and sons. In my opinion, numerous parents have the similar way of treating the child’s gender. When we are growing up, girl babies is located in the relative weakness groups and boy babies is positioned in the advantaged groups. Parents are always insist on thinking about that girls need to be helped more than boys. Emma is such a great role model and leader on this issue! I adore Emma Watson. I think there is a definite need for more people in influential positions like her. I think it isn’t just noble but absolutely necessary for women in social and political positions of power to express their personal experiences and influences from a feminist context. When people like Emma Watson express that their success is partially due to being raised and mentored under feminist ideologies, we can see concrete examples of how women can prove themselves to be equal to men when they themselves assume they are equal. Consequently we can see the detriment of the reverse situation, where women are taught they are inherently unequal to men and therefore fall short of proving themselves to be equal. I think it’s also important to point out the “inadvertent feminists” in our lives and that have influenced us, because there are so many people who hold the belief that women and men are equal and deserve equal rights and opportunities that don’t necessarily identify as feminists. By helping them identify with the feminist movement, the movement gains the followers it needs to implement the concrete changes it seeks, be they social or political. Women in influential positions also have the power to convert the “inadvertent feminists” of the world into identified feminists through their sharing of the beliefs they hold as feminists. For example, my boyfriend would not have learned to identify himself as a feminist were it not for Ana Kasparian, a feminist journalist who talks about feminism on The Young Turks. You make some really great points. I never really knew or followed Emma Watson as a celebrity or person. The only thing I really know of her from is Harry Potter and I loved her character in it for the exact reason that she was a strong, smart, sassy, and independent girl. So to read that she is very similar to her character in Harry Potter in real life is very cool. I respect that she went and spoke in front of the United Nations for change in what she believes in and how brave she is. I will definitely keep a closer eye out for her in the media from now on! People around should should be equal, nobody should be excepted. Feminism is the theory exist because of rights for females weaker than males in the past. Nowadays, female rights begin to be treasured. I have girlfriend, in our relationship I recognised the equality will helps our life easier, such as sometimes we have to deal with some important things. And also I feel the equality gives me chance to reduce stress from my life. I agree with Emma Watson, she is one of great actress and also one of best example of feminism. Emma Watson is a perfect example of a celebrity that uses their influence and platform to achieve a greater good and purpose. It’s really important for young girls to have a strong female figure in their lives. Whether that’s their mother, grandmother, sister, etc. However, I think a lot of young women turn to public figures and celebrity for “direction”—maybe consciously or subconsciously. Lately, many other female celebrities have been following in Emma Watson’s footsteps and using their platform to inspire other young women. I fully support them, and I hope to see many more (and men!) become activists in their own circles. First off, I absolutely adore Emma Watson and the character she plays in Harry Potter. Both are wonderful examples of powerful female characters. Emma Watson herself is just as intelligent as her most famous role. I had the pleasure of listening to her HeForShe speech a few hours after it was released. I was impressed by how she was able to articulate her ideas and the points she mentioned were very valid. This was my first experience of ever hearing her speak outside of scripts and interviews. She begins by stating that feminism the the belief in equality .. this is very important because I feel that many people have a misconstrued idea of feminism is and are afraid to call themselves feminist due to fear of being judged. Ms. Watson also brings up how damaging gender roles are to both males and females. Women are seen as inferior and weaker and not allowed the same freedoms. Men are affected by the traits that are “expected” of them as well. They are not allowed to be emotional without being weak. This leads to repression of emotion that can be toxic for the individual as well as those around the individual. Emma Watson did a wonderful job of bringing attention to this issue and empowering young men and women everywhere to stand up and speak up. That was a great clip. Emma Watson is amazing! She is a great role model for young girls as Hermione Granger and is a great role model as her wonderful self Emma Watson. It is nice to see a woman in the media use her fame for a good cause and try to make a difference in the world. I come across various quotes from her and think “You go girl” as well. I have heard a bit about the HeForShe project and agree with the idea. Feminism is about equal rights, not women’s rights over men. Men should get involved as well. I think that emma watson is absolutely right. The idea that she present is very important because if a woman is doing the same job as a man how come she’s gonna get paid less, a person’s gender shouldn’t hinder a person from being heard, and to have a say on the issues that they care about. Furthermore, I like how she points out that just because she’s a girl why would she be treated less, and that’s what I really like about her she use her influence to bring awareness and help other woman to stand up and let their voices be heard. Yeah, great video! And I love that she is behind the HeforShe project! From my perspective, I believe that the meaning behind “feminist” is the wish to make everyone be more free as well as to get affirmination from others. Emma Watson has always been an inspiring role model. As a female actress, I feel like her making these decisions on her own and standing up for women equal rights is courageous. We need more female actresses like her to be a voice in society! Her quotes are always strong and precise. She knows what she is saying and preaches what she practices. Really appreciate that. love this – great reading!